WATERBURY - Gov. Dannel P. Malloy has cut a ribbon marking the imminent completion of a major project to widen Interstate 84 in Waterbury. State transportation officials say three completed eastbound lanes should open this week, and the westbound lanes should open next month, a year ahead of schedule. The project to add a third travel lane and full width shoulders in each direction along a 3-mile stretch of the highway cost an estimated $330 million. The latest work in the area, which occurred during an eight-week detour, included demolishing three bridges, constructing a box culvert, reconstruction of a local road, and building the new east-west frontage road north of I-84. Final paving of the interstate is expected to be finished this fall. 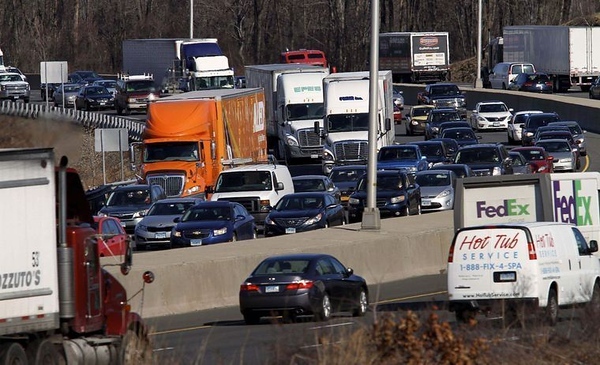 Speaking to reporters, Malloy reiterated the need for the $10 million study on whether to reintroduce tolls in Connecticut to help fund further infrastructure improvements throughout the state. Posted in New Britain Herald, General News, State on Monday, 20 August 2018 13:59. Updated: Monday, 20 August 2018 14:01.